Definition: The Sales Audit is the comprehensive, systematic, periodic, analysis, evaluation and interpretation of business environment, objectives, strategies, principles to determine the areas of problem or opportunities and recommending the plan of action to improve the sales performance. The sales audit is performed by the sales auditor, who can be from within the organization or from outside the firm. The sales auditor takes the following points into consideration while conducting the Sales Audit. 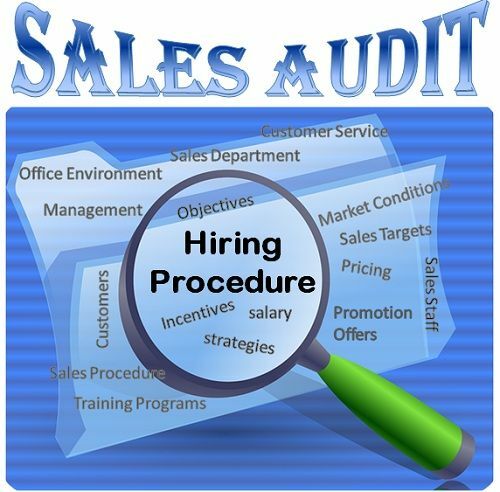 The sales audit begins with the analysis of the Hiring Procedure of the sales staff. Here, the complete records of the personnel, their backgrounds, experience, method of selection, is checked to ensure the correctness of the hiring procedure followed by the company.Also, the training programs are checked to make sure that these are well designed and increases the efficiency of the sales staff. Also, the Market Conditions are also checked to see whether the company’s sales targets are feasible or not. The auditor generally performs the SWOT (strengths, weakness, opportunities, threats) analysis, in which he analyze the opportunities and threats that exist in the external environment and have a huge impact on the sales strategy.He checks the prospective threats from the competitor and also determines the opportunities that can give a first mover advantage to the firm. The auditor checks the Sales Procedure followed to facilitate the sales. The discounts or any other promotion scheme offered to the customer should be in line with the company’s profit objective.Thus, the auditor compares the ideal Sales Procedure as written on the paper with the actual operations performed by the firm. The Auditor also checks, the quality of the Customer Services offered once when the product was sold or at times when the problems were encountered.The repurchase of the product solely depends on the after sales service offered by the company.Thus, the auditor analyses the performance of the company in terms of its services and give the recommendations for the improvement, if any. The Office Environment, wherein the sales staff, operates play a significant role in achieving the sales targets. The business environment should be created in such a way that it should be in the best interest of the workers so that they can work up to their potential.The relation with the managers, Co-workers, and other department’s personnel also affects the efficiency of the sale staff and thus the auditor checks all these perspectives and prepares the sales audit report accordingly. Thus, the sales audit involves the analysis of the entire sales process starting from the sales objectives set for the ultimate sales done by the company’s sales staff. excellent & thanks for the information provided.